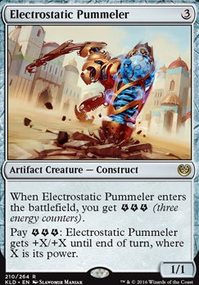 How many times can you pay 3 energy for electrostatic pummeler? 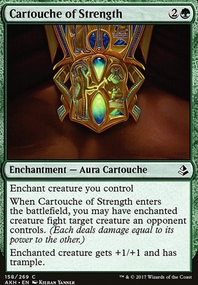 Have you thought about using creatures like Taunting Elf and Shinen of Life's Roar to make sure your other creatures don't get blocked? They're not as fast, but would make sure all your creatures get through, instead of just one. Which option is better probably depends a lot on your playstyle. Phytoburst , Briar Shield (seems almost strictly better than Seal of Strength ) and Scent of Ivy might be good buffs for this deck. Maybe Aspect of Hydra too, but I feel like it would generally be weaker than it alternatives. 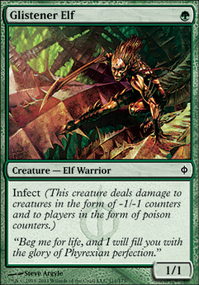 Potentially some Trample, like Larger Than Life or Predator's Strike if you feel like your damage isn't getting through. Hey! This is pretty nice! You could add Larger Than Life , but otherwise you have a solid deck. It's a +1 from me!!! especially since I wanna experiment with the Revenge. but I can swap Phytoburst for Mutagenic Growth . Love the turn two mutagenic wins. I really like the concept of this deck. I have a few things that combine deathtouch and trample, but no all-deathtouch decks. That may need to change. :-) Evasion, such as flying and fear are nice to include in the mix, as you have. After all, the opponent may be running some deathtouch too. Your Viridian Longbow and Nature's Way go a long way to cover that base as well. Still, there's nothing like trample for a deathtoucher, as it lets you kill another critter along the way, and even against an indestructible blocker, it lets you deliver all but one power to the face or to take out several blockers if they want to line 'em up like dominos for ya. That said, I'd try to find a place for more trample action, either in the critters themselves or in the buffs. Deadly Recluse - Another deathtouching early blocker, but this one has reach. 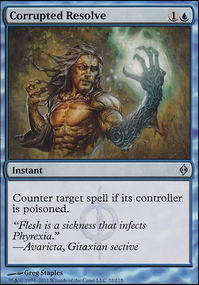 First strike is also really nice in a deathtoucher, but if you try to have everything, it dilutes a deck too much. Hey, great deck, love the simplicity of it. 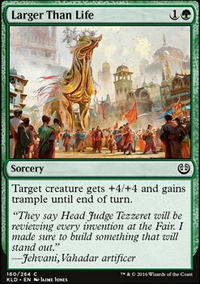 I know it's meant to be on a budget, but if you wanted to break that budget and potentially make it a bit stronger, Ash Barrens gives you better tempo than Jungle Hollow, and if you were to lean green a bit, Utopia Sprawl is one of the best accelerants in the game IMO. The deck has little defenses to speak of, so you need to be attacking as much as possible. Since your Vampires only get pumped for a turn, Larger Than Life is a good supplement to Fists of Ironwood, with the only drawback of not producing more tokens to sac. The net gain is the same, so that's handy if the deck can't seem to attack enough. You could also take a look at Commons that have Morbid, which could be triggered after any sac, and are mostly found in green and black. There are several worthwhile ones that are Pauper-legal.